Season 2.5 returns on Syfy on Wednesday, October 19th. Are you ready to find out if it's real? @DLMARBLEfof Great day of shooting! Now a few days off before the next mystery! 9/20/11 @MissLanishaCole Another GR8 day with the#FactOrFaked team @Jaeldepardo @austinrporter @BillPMurphy @DLMARBLEfof @BenHansen00- Doing it all again mañana! 9/18/11 @BenHansen00 This season has lots of explosions, check out the trailer on line! 9/15/11 @austinrporter I'm still In shock from the investigation last night w @BenHansen00 and @MissLanishaCole. Never have I had so much activity and Interaction. @MissLanishaCole On our next #FactOrFaked investigation with @austinrporter & @BenHansen00- this place is CREEPY!! I already have goosebumps! #ReadyToGo!! @DLMARBLEfof Flying today ... 3 cities, 2 flights, 1 layover, and I can already see the extra security. @DLMARBLEfof Hitting the skies yet again with @austinrporter and @FactOrFaked crew! @BillPMurphy Compelling evidence requires high quality investigation tools, time to break out the big guns! @DLMARBLEfof Thx everyone 4 the bday wishes yesterday! A great day filming & celebrating! But there's still a mystery to uncover, so back to the grind! @BillPMurphy Sometimes people ask what type of paranormal event is my fav, well the episode we're filming is tackling just that kind of case. @DLMarblefof Hitting the skies for another adventure with @FactOrFaked @MissLanishaCole @BillPMurphy. What will we find next? Tune in Oct 19th! 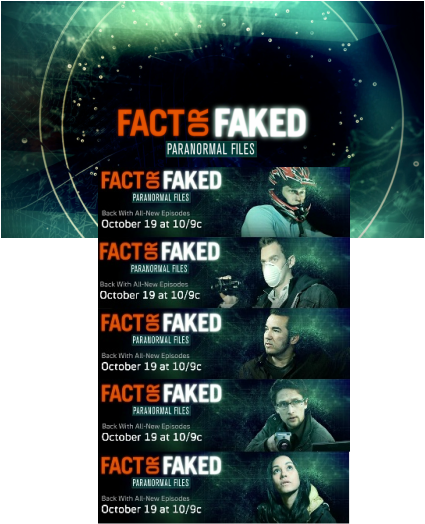 @austinrporter New episodes of fact or faked - October 19th at 10pm! Austin Porter (Via fb) Within the hour i will be standing in front of PYRAMIDS.... this is going to be good. Austin Porter (Via fb) Taking off to in international destination to uncover the deadly truth behind our next case..... I wish I could tell you more. Danger !!!!! @DLMARBLEfof Gearing up to investigate something mysterious and awesome with @BillPMurphy and @Jaeldepardo. Will it be @FactOrFaked? @BenHansen00 You can be sure that when I don't tweet for a while, a good case is brewing! No cell service but I have internet. Go figure. @MissLanishaCole So EXCITED to announce that I'm part of the #FactOrFaked team!I'll be uncovering the truth behind supernatural and unexplained occurrences! @DLMARBLEfof Sitroom filming is brutal! Soo many good cases to choose from, I want to do them all! The new @FactOrFaked season in OCT = Epic. @Jaeldepardo Filming in the Situation Room with Fact or Faked team @austinrporter @BenHansen00 @DLMARBLEfof @BillPMurphy team bringing some good cases! @Jaeldepardo Driving home from 3 weeks with Fact or Faked. Excited to spend some time home this weekend! My couch and a movie sounds amazing right now. Austin Porter ‎*via fb) 6am..... Thats a wrap. @Jaeldepardo Up and at em'! @Jaeldepardo 5am wake up call. Ouch. @DLMARBLEfof On location for another eps. Knockin 'em down! Btw ... this one will probably be my favorite yet! @BenHansen00 Sorry for not being so active to responding everyone. I have 2 hours to do laundry and I'm back on the road for a few days. @BenHansen00 In El Paso getting ready to fly to Philly 2mrrw for Ft. Mifflin! I think I get in right before the fun starts.Hopefully no plane delays... @DLMARBLEfof Another one in the can! @Jaeldepardo And that's a wrap for case #3! @Jaeldepardo There's no doubt, when I'm up this late I become goofy. @Jaeldepardo Pulling another all nighter with the Fact or Faked team. Experiments are in full effect. @Jaeldepardo Quick pit stop in LA tonight. Race begins to catch up with friends before I go back on the road tomorrow. @Jaeldepardo The sun is showing first light over the horizon..@FactOrFaked conducting experiments. 7/1/11 @austinrporter On location filming possibly one of my favorite episodes of fact or faked yet with @Jaeldepardo and @BillPMurphy. 7/1/11 @Jaeldepardo Late night experiments with the team. @FactOrFaked still on location..
6/30/11 @Jaeldepardo It's only 11:30am and it's already been quite a big day. Gasp. 6/29/11 @Jaeldepardo Up late doing a bit of reading about my first case tomorrow..
6/25/11 @DLMARBLEfof Yo @FactOrFaked fans! I'm geared up and ready to shoot. It begins! Are you ready for the next season already? The new cases are beyond cool! 6/24/11 @BenHansen00 Happy Friday to everyone! I apologize for falling off the earth. Filming starts Monday! Then Ft. Mifflin investigation on July 9th. Sign up!